As a subscriber and member of the ADA, you will be joining the nation's leading nonprofit health organization to prevent and cure diabetes and improve the lives of all people affected by diabetes. 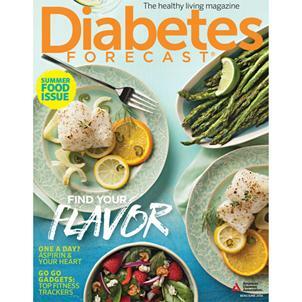 Your 1-year membership includes 6 bi-monthly issues of Diabetes Forecast® in both print and digital formats, with practical tips for day-to-day living with diabetes. You'll join our network of diabetes support and information and be eligible for discounts from our strategic partners. Please allow 6-8 weeks for delivery of your first issue of the magazine. I love this publication. I have received it on and off for years, and while it has changed due to the increase in Type 2 diabetes, it is still a wonderful source of information. When I was first diagnosed with diabetes, I craved information, and Diabetes Forecast was one of the places that I found it. If you're a geek like me (I have degrees in science education), you will also enjoy reading the professional journals Diabetes and Diabetes Care. When I want to look up a specific research article, or just do some reading about new diabetes research, I can access these publications at the local medical library at one of the local hospitals. Great publications!